It was after 3 P.M. in County Center on a hot Friday in September. The previous evening at 6:15 P.M., Hillsborough County Chief Financial Administrator Bonnie Wise had requested that “errors” be corrected in the Transit Tax performance audit report delivered by the auditing firm McConnell & Jones (M&J). However, OPPAGA never closed that loop, as a public records request to OPPAGA shows. Leventhal is a chief legislative analyst at OPPAGA and was the point of contact for the audit. It is unclear why she didn’t “close the loop” as she said she would. Thus the corrected and final version of the performance audit report was never uploaded to the county website. 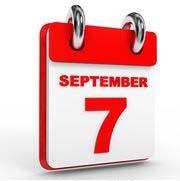 By state law, the report must be uploaded at least 60 days before the referendum, and that Friday September 7th was the deadline for the November 6, 2018 election. 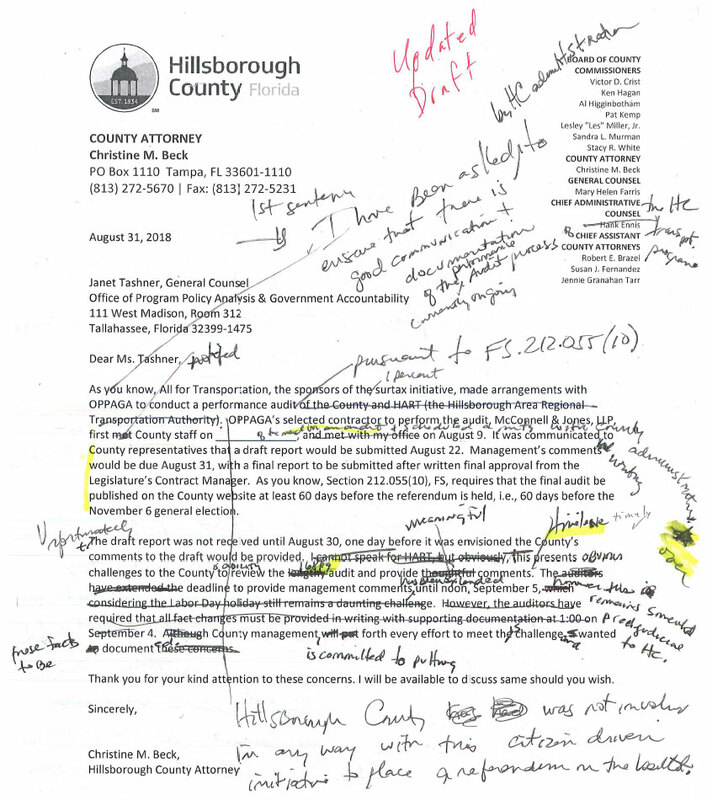 The Hillsborough County Attorneys’ Office (CAO) told the Guardian that “the edits were not substantive.” However, Wise had called them “errors,” not “edits.” CAO further stated that the “absence” of the corrections “from the report posted on the County’s website has no impact on the report satisfying the requirements of a performance audit” having been posted on the county website. In other words, an audit report is available for citizens to view on the county website. The report is not the final version, or even accurate. But it’s a “performance audit” report, and that’s all the law requires. OPPAGA’s general counsel Janet Tashner also maintains that the statutory requirement has been met, stating that the penultimate version “is the final audit report that OPPAGA considers to be final as to Deliverable #5” in the contract. OPPAGA is the state agency responsible for overseeing the $145,000 audit. OPPAGA selected Houston-based M&J to perform this audit of Hillsborough County and the Hillsborough Area Regional Transit Authority (HART). OPPAGA also selected M&J to simultaneously perform an audit on the Hillsborough County Public Schools (HCPS), an agency also seeking to have a sales tax increase placed on the ballot. But what kind of track record does M&J have? In its response, M&J agreed with “certain findings” of the PCAOB report and said they had “taken action” to address them. Yet in M&J’s draft audit report, the very first table summarized the county’s budget and incorrectly gave “Amounts in thousands” of dollars. It should have said millions, not thousands. This error was corrected in the report now available on the county website, but the error shows that M&J was unable to detect numbers that were off by three orders of magnitude. M&J also does not appear to have a standard way of reporting financial figures. In the HCPS audit M&J was also performing, amounts were presented long form, with unnecessary decimal points showing “.00” for each amount. Not so in the audit of the county and HART. See comparison below. Thus M&J issued both audit reports on the same date, yet used completely different number formatting in the two reports. The number formatting in the school board audit report is amateurish, giving amounts to the penny for a three billion dollar budget. M&J also delivered the draft report to the county 8 days later than they had promised in their work plan. This gave the county only one day to go over the 168-page draft report before giving management response. County Attorney Christine Beck wrote to OPPAGA general counsel Janet Tashner that “the deadline to provide management comments has been extended until noon, September 5, 2018. However, this remains somewhat prejudicial to Hillsborough County.” In others words, the county was still not pleased. Beck’s letter went through several revisions. The pressure on the county caused by M&J’s delay and sloppy work can perhaps best be illustrated by a portion of Beck’s final edit to her letter to OPPAGA, shown immediately below. The days between August 31 and September 5th straddled Labor Day weekend, thus making the rushed work caused by vendor delay even harder. The picture that emerges from the e-mails reviewed is one of county staff working dutifully to cooperate with an audit that the county didn’t think they were subject to. Yet at the end the audit process, on a hot Friday and for reasons unknown, the corrected report was not uploaded to the county website. Instead, an error-filled version in need of “corrections” was declared the final version. Audits must be performed before a sales tax increase is placed on the ballot in order to comply with to a new statutory requirement for this year. 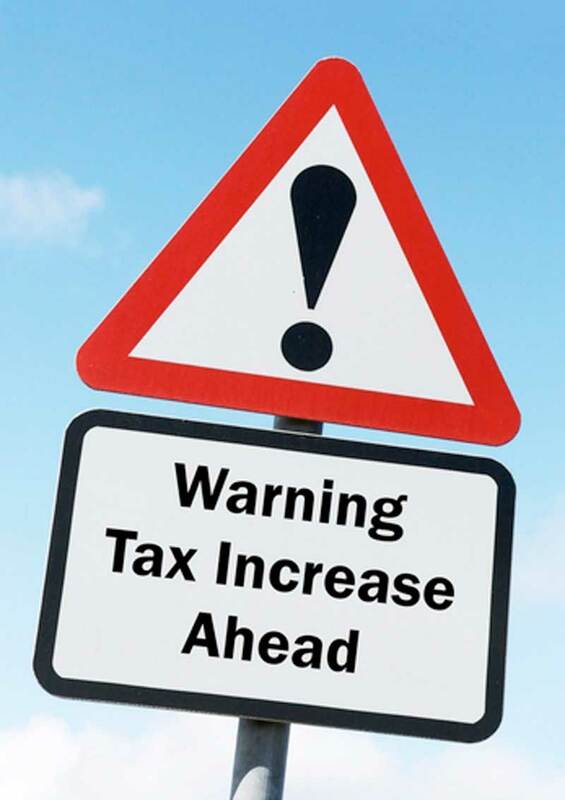 On April 16th, OPPAGA’s top official Philip Twogood told school boards around the state seeking such tax increases that they had one week to get their enabling ordinances to OPPAGA if the necessary audits were to be performed in time. The transit tax didn’t make the ballot until seven weeks after the school tax, yet OPPAGA still agreed to perform audits for both so they could appear on the ballot. Six month audits became three week audits, and were performed well past the deadline OPPAGA itself had established. Why? Was there behind the scenes shenanigans? And are such hastily conducted and error-filled audits of any value? Bonnie Wise, Christine Beck, Emily Leventhal, Hillsborough Area Regional Transit Authority, Janet Tashner, McConnell Jones, OPPAGA, Public Company Accounting Oversight Board.